Like humans, mare’s estrus affects temperament and “touch sensitivity”. Many mares in heat are “testy” and irritable and will be “cinchy” and do not want to be touched in their flank area, due to their discomfort. A mare’s estrus (reproductive) cycle is polyestrous; i.e. having a reproductive season and a non-reproductive season. Then on-reproductive season is late fall and winter and the reproductive season is basically spring to fall; there are, of course, geographical variations. A mare’s “heat” cycle is affected by increasing hours of bright sunlight with the highest “effective” reproductive “point” being the longest day of the year, Summer Solstice. Most mares have 21 to 22 day cycles [the duration of time between ovulations] and remain in estrus for three to five days each time. While that is the standard, in reality each mare has her own unique nature and variation of cycle. Wide variations in the cycle can make it difficult to breed. 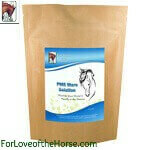 PMS Mare solution both regulates estrus cycles and calms the temperamental mare while relieving their flank and lower abdominal pain. Use this herbal solution from spring to fall as needed. When using PMS Mare solution to regulate estrus in order to have your mare impregnated, give this solution consistently throughout the entire estrus cycle until breeding is successful. Ingredients: bo he, xiang fu within a proprietary blend. 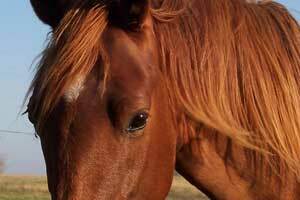 PMS Mare Discounts Apply !